Email Marketing is regarded as more effective when compared to social media marketing as the latter one could be messy and daunting to be measured. However, a marketing strategy that has taken the advertising industry by storm is the integration of social media marketing and email marketing. This means that you are taking advantage of two strategies that work in tandem to fetch more customers to your business. While social media sites have influencing click through rates, newsletters swing traffic with the promised content which is available in the form designed by the customers. In order to successfully promote your brand, it has become important for business professionals to rely on these two channels. 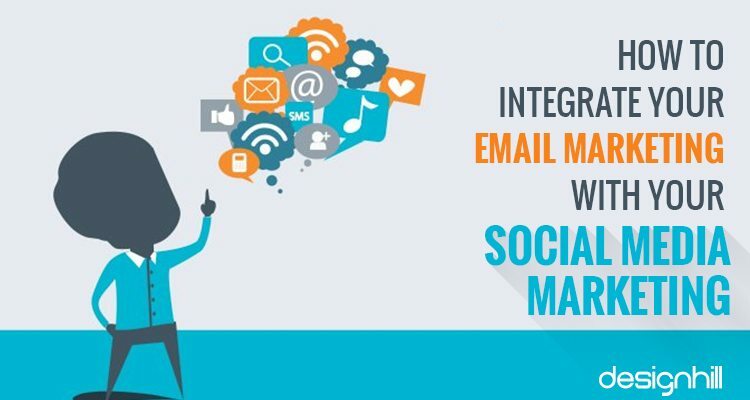 However, before implementing this strategy to your marketing campaign, you need to understand the importance of integrating social and email marketing. By adding social media buttons to the emails (in the footer section where email signature appears), you can let your readers to know your presence on various social media sites. Moreover, your fanatics can also click those social buttons included within your emails to view the social profiles of your organisation. Having a stunning Social Media Page Design is also important to entice the customers. In order to add buttons, you must be in the edit mode of the block. You need to click on social tab on the tools located on screen’s left side. You can also choose the kind of button that you want to add just by clicking on any of the networks. Then, you should add the exact link of your page in the link box so that the users will be directly taken to your appropriate page. Following this, you need to click on insert Button to add button to the block. The job is done! Not most individuals are aware of the fact that they can send an email whilst promoting it on social media channels using simple share tool. All you need is to go to Schedule Step of the Email and then click on Simple Share Button located at the bottom of the screen. Then, you should choose the social networks that you want the message to be posted to. When you send an email, Simple Share will be posting the messages that you have created to your chosen social sites and thereby providing you with the opportunity of increasing the reach of your message. The Share Bar is the row of social media buttons which can be added to the top of the email. By doing so, you can enable your readers to share your message with their family and friends through social media. In order to include the share bar, you must go to Header Options and click Pencil Icon. Then click at the check box and OK. Once you have done this, the Share Bar will be appearing at the top of email and just below will be the front name, subject and reply mail. When any of the social buttons are clicked by your readers, they can easily post a link to your email on their social profile page. So, their followers or friends who view those posts can click the link and read your mesas age. Most people might have heard about the changes to My Library Plus and My Library accounts. These changes allow you to integrate images from your instagram and facebook accounts to emails. Once you have obtained the new My Library Tools, click on Social Network Tab and get connected to Instagram and Facebook. Then you can choose your preferred photo to upload and then insert it into your email newsletters. Of course, it is extremely important to inform your audience about the social networks from where you have taken the photos. You must also entertain social media engagement so that your audience could follow you. 1. Increasing your viral reach by sharing your emails on all social media sites. When you want to make your emails to go social, you must always entice your customers so that they can interact with your business and get part in your marketing campaign either directly or indirectly.